8 June 2016 is World Oceans Day. 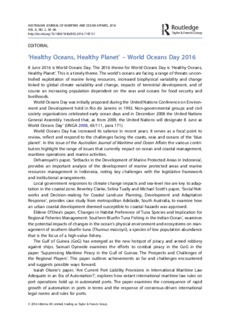 The 2016 theme for World Oceans Day is ‘Healthy Oceans, Healthy Planet’. This is a timely theme. The world’s oceans are facing a range of threats: uncontrolled exploitation of marine living resources, increased biophysical variability and change linked to global climate variability and change, impacts of terrestrial development, and of course an increasing population dependent on the seas and oceans for food security and livelihoods.